Coconut palms are common in the lush landscapes of tropical regions. Traditionally, they provided food, water and shelter to Pacific Islanders. These days, they are increasingly popular in household landscaping projects. 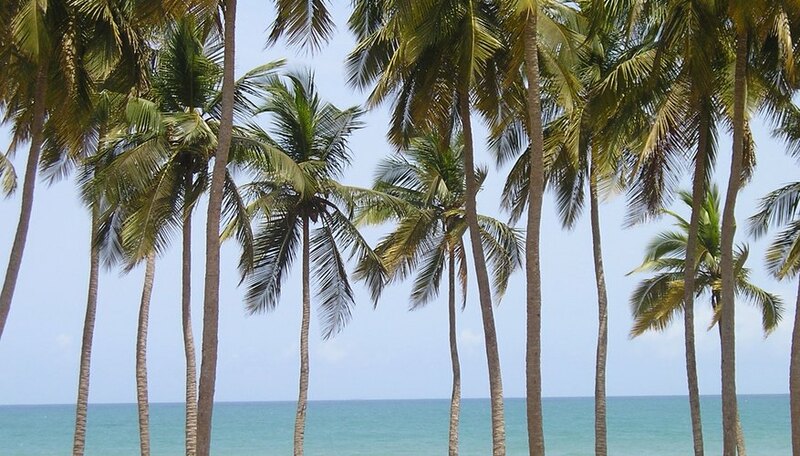 At full height, coconut palms can reach 100 feet and have been known to produce coconuts for a century. Dwarf varieties are available and often grow well in large containers. Choose a site in your yard. A coconut palm needs at least eight hours of sun a day and plenty of room to grow. Find a fairly large area (at least twice the height and width of your palm) with well-drained soil. Purchase a young coconut tree. Local nurseries carry many varieties and can provide you with planting advice. You also can grow a tree from a coconut by soaking the coconut (with husk) in water for three days and planting in a container. Cover the surface with mulch. Spread the mulch around the base of the plant the same width as the canopy. This will keep the soil moist and prevent an onslaught of weeds. Water your palm immediately after planting. During hot summers, water your palm three times per week to keep its leaves green. Water at least twice a week for the first six months of growth. Fertilize your coconut palm regularly. The most common problem with coconut trees are deficiencies of vitamins and minerals. One ounce of slow-release palm fertilizer per 3 inches of trunk is sufficient after initial planting. Use a fertilizer specially suited for palm trees to ensure healthy growth. Protect your palms from frost by insulating the roots and branches and wrapping them in plastic. Avoid pruning your palms at all costs. Nutrients from old fronds are recycled back into the heart of the tree and will shed naturally.